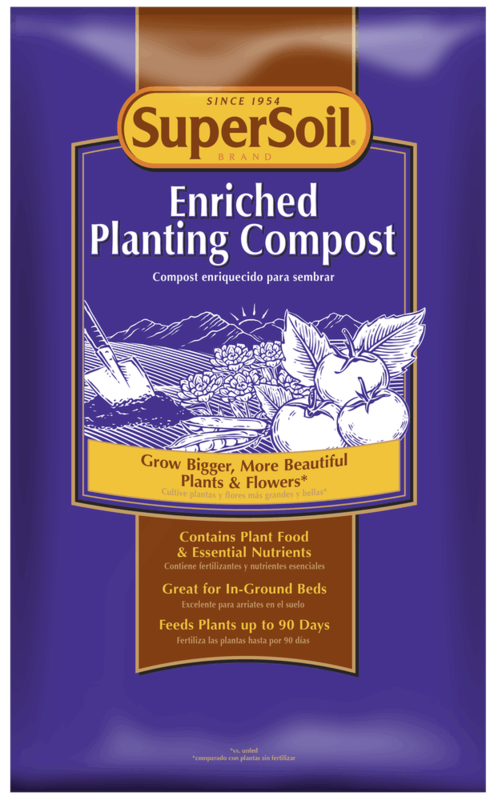 SuperSoil Enriched Planting Compost contains a premium blend of sphagnum peat moss, organic compost and fertilizers to create an excellent in-ground growing environment. Plus, it contains plant food for up to 90 days of feeding! Contains plant food and essential nutrients for up to 90 days of feeding. For planting individual plants. Dig a hole twice as wide as the container/rootball. Mix Enriched Planting Compost with 1 part native soil. For amending beds, apply a 3-inch layer and work into the top 6 inches of the soil. Plant seeds or live plants following specific package or plant tag instructions. Water thoroughly after planting then daily. Cover area with mulch. Apply when planting flowers and vegetables outdoors (not in containers), or when preparing soil in outdoor gardens and landscape beds. Amend in-ground gardens annually mixing with 1 part native soil. Good all-purpose planting soil for in-ground use. Should not be used in pots or containers. Good for in-ground flower and vegetable beds.